Register account and don’t lose your projects again. Now links to games are saved on server instead of local storage where a user could just clear the browser’s cache to clean recent project list. And if you forgot to bookmark or save the project link it might be lost forever. Sign up supports Github, Google, Facebook and regular email accounts. You should know that users are resolved by email address, so you can sign in with Github or Google into same account. 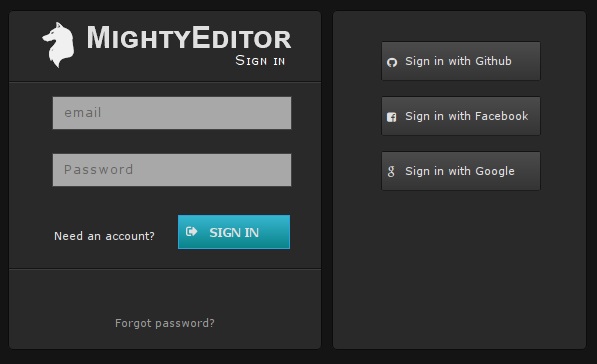 MightyEditor has now also subscriptions. It is the easiest way to support development of editor. We have 3 tiers of accounts. 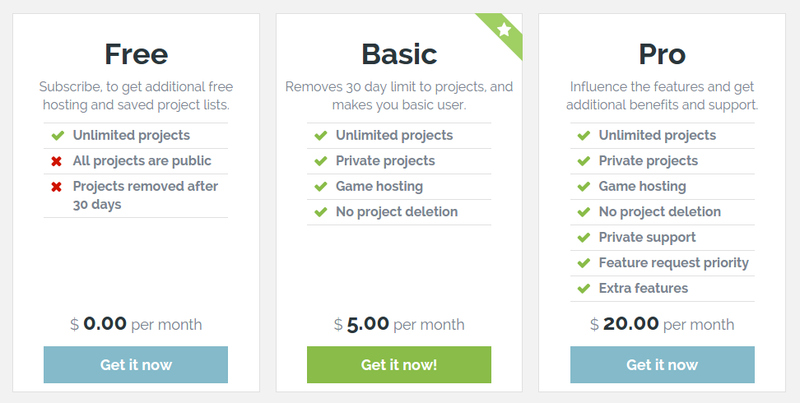 Free – allows gamedevs to create an unlimited number of projects. This option is limited by the fact that the project is public (and can therefore be used by anybody who has a link). Free account projects will also become automatically deleted after 30 days. Basic option attracts a small charge of 5 USD per month and offers the same complete functionality as the ‘Free’ access, but with the added benefits of private projects which are not time limited, hence they are not deleted after 30 days. Pro access encompasses all of the above, with the addition of live support and consulting. In addition, the MightyFingers team will seriously consider your feature requests make them as priorities in editor development plan. It should be noted that further pro benefits, such as one click mobile export, will be released soon.